The 28% increase from last year – to a total of 84,745 permits – is sought in part because of concerns about tick-borne diseases in southern and central Maine. 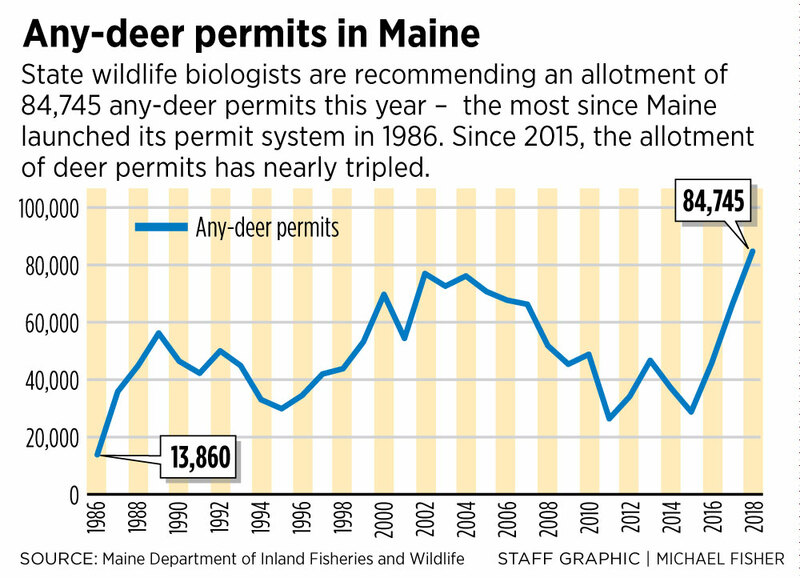 AUGUSTA — State biologists on Tuesday recommended issuing 84,745 any-deer permits for this fall’s hunt, an increase of 28 percent from last year and the highest total since Maine launched its permit system in 1986. The proposal mirrors objectives outlined in the Department of Inland Fisheries and Wildlife’s big-game management plan, which was updated in April for the first time since 2001. The plan, which involved extensive input from the public, calls for culling the deer herd in southern and central Maine – largely over concerns about tick-borne diseases. “The vast majority – 90 percent – of the permits are in central or southern Maine,” Judy Camuso, director of the department’s Wildlife Division, said during an IFW Advisory Council meeting Tuesday morning. Maine also fell short of IFW’s projected doe harvest in last fall’s hunt. State biologists had projected a doe harvest of 7,114, but it came in at 5,950. “This is one of the reasons for the proposed increase in permits for 2018,” said wildlife biologist Nathan Webb. In nine of the state’s 29 hunting districts, mostly in southern and central Maine, the proposal would increase any-deer permits by as much as 50 percent to 75 percent. IFW estimates there are 230,000 to 250,000 deer statewide. From 2002 to 2005, IFW allotted more than 70,000 any-deer permits annually; this year would mark the first time more than 80,000 permits are distributed. The advisory council will vote on the proposal this summer. As recently as 2015, the department allotted only 28,770 any-deer permits after a harsh winter caused concerns about the health of the herd. The number of permits has nearly tripled since then. In 2017, 78,393 hunters applied for 66,050 permits. In northern Maine hunting districts, permit levels will remain the same or be reduced because the winter was harder on deer, Camuso said. In six of 29 hunting districts, permits would be reduced by 50 percent to 75 percent. IFW Commissioner Chandler Woodcock said the dramatic increase in permits may alarm the public, but he said in general there is only one doe harvested for every 10 permits because many hunters choose to shoot a buck if given the chance. The increase in permits made sense to hunters across the state, particularly the huge jump in southern Maine. White-tailed deer are a host for the deer tick, which carries the Lyme disease bacteria. In 2017, there were a record 1,787 cases of Lyme disease, according to the Maine Center for Disease Control and Prevention. George Fogg, president of the Cumberland Rifle and Pistol Club, said the dramatic increase in permits is welcome. In Washington County, hunter Butch Moore of Milbridge said it’s widely known that southern Maine has a serious deer problem.